Towards the start of the year we discovered that Welcomm were paying an extortionate rate of 50% over the current market price for our electricity. When considering the amount of electricity our computers and servers use on a daily basis, this saving racked up to 1000s of pounds over a year period. This will undoubtedly make a huge difference to Welcomm’s end of year figures and help raise our profits. So this resulted in an exciting new venture from Welcomm. We added Energy to our portfolio of services offering gas and electricity savings reviews to our customer base to see if we can help them save money too. This discovery made us think about how many other companies are also overspending each year, unnecessarily. As you may be aware, the UK energy prices are directly affected by the commodity market price of oil. 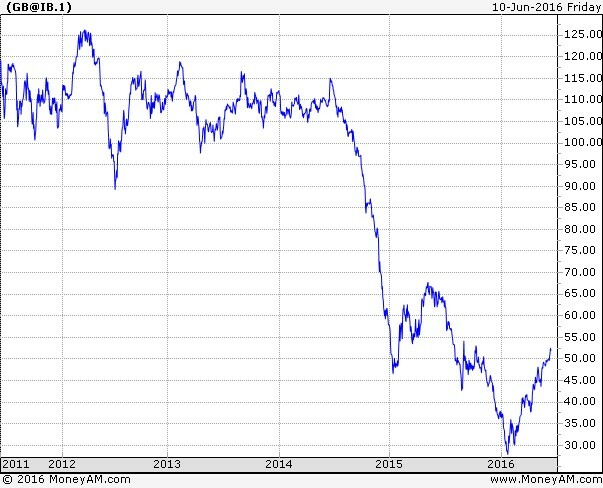 Oil prices have been steadily increasing from an all decade low since last November (see the graph below). According to the Telegraph, Market Experts at ICIS said the price of gas increased by 29% over the second quarter, while wholesale electricity prices rose 25%; this is due to a significant collapse in the value of the pound. The recent Brexit result has also added a further degree of uncertainty around what this could mean for energy many businesses are concerned that oil prices will increase as we leave the EU, having a huge impact on their annual spend. Although we cannot predict what will happen, we can help control your business costs reviewing your current bills, comparing these to the cheaper tariffs that are available right now and locking in lower prices for the next 5 years. Then, no matter what Brexit brings, your finances will be safe. Welcomm Energy are offering businesses a free energy audit to find them the best deal available from the top 12 UK energy suppliers. We will then help you to switch with minimal hassle. We regularly save our customers 10-50% in their gas and electricity bills, enabling them to re-invest this capital into growing their businesses. If you want the reassurance of knowing you are paying the best rates for your gas and electricity from an unbiased, independent source simply call our friendly Energy Team on 0800 064 64 64 or email nicola.bingley@welcomm.co.uk for your free audit.